WIW: pleated skirt pattern mix. ETA ...	Festive wear 12-4,5,6. Fair Isle? Second day of the Festive December challenge. 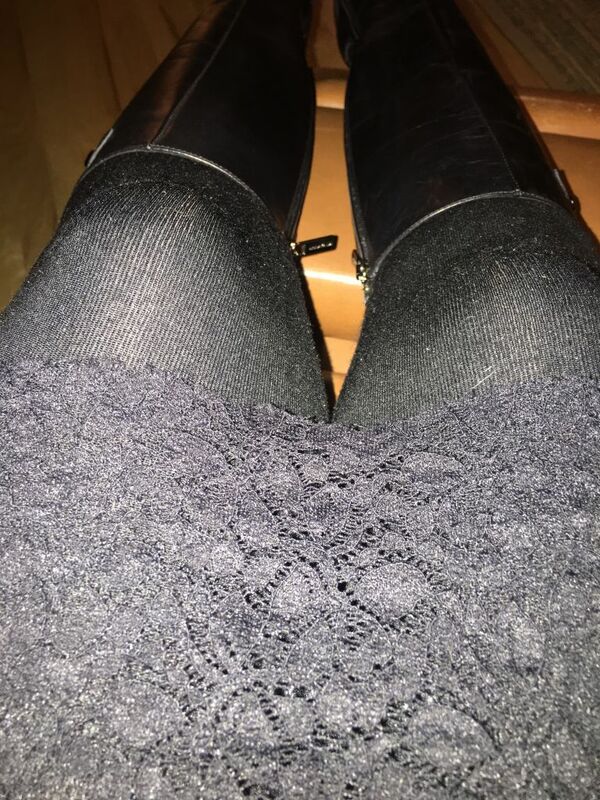 For church and a later lessons and carols Advent program I wore a black merino top with a black lace tube skirt, black leather tall boots, black fleece-lined tights and black leather trench coat. For relief from all the black, a silk black, white and grey scarf and sparkly snowflake earrings from yesterday were added. You can’t see all the textures very well, so I took a photo of part of the lace skirt, tights and boots. Lots of black with pearls or sparkly beads at church today although several went deep purple for Advent. I welcome your comments and suggestions. On the closet edit, I discovered a wool dress that I feel is too short even with leggings and a black velvet top that seems too tight. Both are history. The lace skirt I am wearing needs to earn its place. It does not get much wear in my mostly casual life, but has its moments like dressing up a sweater and tights and boots on a very cold day to be part of a warm comfortable outfit. You will probably see it again this month. Always great to see a black textural outfit and yours is excellent. The scarf lightens up the black and is wonderful with your hair. I have a sugar eye for leather coats and wow, yours is gorgeous. The skirt seems to have earned its place, I hope. Very nicely done! The scarf is beautiful with your hair. I love the textures, and I have a soft spot for lace skirts! Lovely, joy! I love the textures. Warm and festive! The leather trench is absolutely beautiful, and so elegant paired with the silk scarf. You look very elegant.subtle nods to the season are what’s required in early December I feel and this is what you have achieved. This is very elegant-festive. Well done! You look wonderful, and I agree that the scarf is great on you. Trinity from 'The Matrix' for the real world! A column of black is so sophisticated on you - with your fantastic hair, the whole thing is dynamite! Thank you all for your encouragement and kind comments. I enjoyed the textures from this outfit and felt festive. It may be past time for a haircut. Black always says dressy to me when the fabrics are rich and textured like this ! Thank you, Shevia and Taylor. You made my day! The column of black really showcases your beautiful hair. Leather, boots and lace is always a great combination. All the textures look wonderful together! I love all the different textures in your black outfit. I think that's the key to making all black outfits look current and interesting. Wow! Love the leather and lace juxtaposition and the pop of white with your gorgeous hair. Thank you for your kind comments, karen13, Sara L., DeAnna and Bijou. I am happy that you like the outfit. Gorgeous Joy - I think you look wonderful. It is fun to have a lace skirt to pull out at this time of the year. The scarf complements your hair very deliciously, Joy. I love the way it breaks up the black. You look fabulous. Rock on. Good job passing on the two short dress. Thank you, Angie. You are a sweetheart to comment on this thread while traveling. I always appreciate your wisdom. You are a true professional.